This program is FREE, thanks to headspace Elsternwick. This is the 10th holiday program that Headspace has supported GameAware to run. Headspace has been a valuable ally in helping teens conquer mental health challenges that are sometimes masked by excessive gaming. 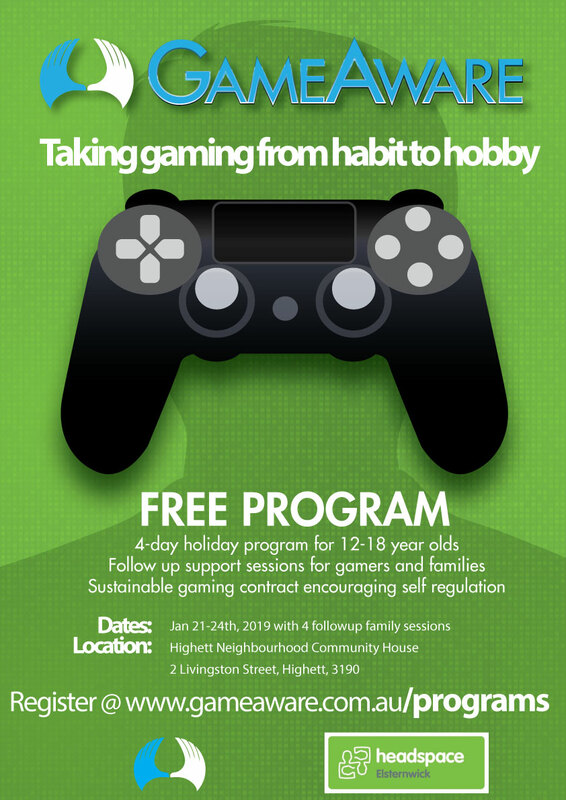 The Holiday Program is designed to encourage responsible gaming by improving self-regulation and increasing social connection through additional hobbies, strategies and and self-awareness. On the other hand, this program is also designed to help gamers enjoy and improve their gaming as they trade quantity for quality. Being game-aware means you know how to revolve gaming around your life instead of your life around gaming. It’s not uncommon for gamers actually enjoy their gameplay more than they did when they weren’t gaming intelligently. A Social Gaming Experience – a LAN party at Game Cave. Access to the online resource to provide ongoing support. Parents can use this to become empowered with the knowledge and strategies necessary to help our gamers make this a sustainable change. 4 evening sessions to implement the intelligent gaming strategies.